The Florence Baptistery (Italian: Battistero di San Giovanni), also known as the Baptistery of Saint John, is a religious building in Florence, Italy, and has the status of a minor basilica. The octagonal baptistery stands in both the Piazza del Duomo and the Piazza San Giovanni, across from Florence Cathedral and the Campanile di Giotto. The Baptistery is one of the oldest buildings in the city, constructed between 1059 and 1128 in the Florentine Romanesque style. Although the Florentine style did not spread across Italy as widely as the Pisan Romanesque or Lombard styles, its influence was decisive for the subsequent development of architecture, as it formed the basis from which Francesco Talenti, Leon Battista Alberti, Filippo Brunelleschi, and other master architects of their time created Renaissance architecture. In the case of the Florentine Romanesque, one can speak of "proto-renaissance", but at the same time an extreme survival of the late antique architectural tradition in Italy, as in the cases of the Basilica of San Salvatore, Spoleto, the Temple of Clitumnus, and the church of Sant'Alessandro in Lucca. The Baptistery is renowned for its three sets of artistically important bronze doors with relief sculptures. The south doors were created by Andrea Pisano and the north and east doors by Lorenzo Ghiberti. The east doors were dubbed by Michelangelo the Gates of Paradise. The Italian poet Dante Alighieri and many other notable Renaissance figures, including members of the Medici family, were baptized in this baptistery. It was long believed that the Baptistery was originally a Roman temple dedicated to Mars, the tutelary god of the old Florence. The chronicler Giovanni Villani reported this medieval Florentine legend in his fourteenth-century Nuova Cronica on the history of Florence. However, twentieth-century excavations have shown that there was a first-century Roman wall running through the piazza with the Baptistery, which may have been built on the remains of a Roman guard tower on the corner of this wall, or possibly another Roman building. It is, however, certain that a first octagonal baptistery was erected here in the late fourth or early fifth century. It was replaced or altered by another early Christian baptistery in the sixth century. Its construction is attributed to Theodolinda, queen of the Lombards (570-628) to seal the conversion of her husband, King Authari. The octagon had been a common shape for baptisteries for many centuries since early Christian times. The number eight is a symbol of regeneration in Christianity, signifying the six days of creation, the Day of Rest, and a day of re-creation through the Sacrament of Baptism. 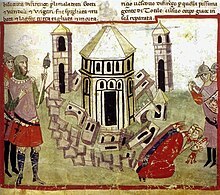 Other early examples are the Lateran Baptistery (440) that provided a model for others throughout Italy, the Church of the Saints Sergius and Bacchus (527-536) in Constantinople and the Basilica of San Vitale in Ravenna (548). The earlier baptistery was the city's second basilica after San Lorenzo, outside the northern city wall, and predates the church Santa Reparata. It was first recorded as such on 4 March 897, when the Count Palatine and envoy of the Holy Roman Emperor sat there to administer justice. The granite pilasters were probably taken from the Roman forum sited at the location of the present Piazza della Repubblica. At that time, the baptistery was surrounded by a cemetery with Roman sarcophagi, used by important Florentine families as tombs (now in the Museo dell'Opera del Duomo). The present much bigger Baptistery was built in Romanesque style around 1059, evidence of the growing economic and political importance of Florence. It was reconsecrated on 6 November 1059 by Pope Nicholas II, a Florentine. According to legend, the marbles were brought from Fiesole, conquered by Florence in 1078. Other marble came from ancient structures. The construction was finished in 1128. An octagonal lantern was added to the pavilion roof around 1150. It was enlarged with a rectangular entrance porch in 1202, leading into the original western entrance of the building, that became an apse, after the opening of the eastern door, facing the western door by Lorenzo Ghiberti of the cathedral in the 15th century. On the corners, under the roof, are monstrous lion heads with a human head under their claws. They are early representations of Marzocco, the heraldic Florentine lion (the symbol of Mars, the god of war, the original male protector of Florentia, protecting a lily or iris, the symbol of the original female patron of the town (Flora, the fertile agricultural earth goddess). Between the fourteenth and sixteenth centuries, three bronze double doors were added, with bronze and marble statues above them. This gives an indication that the Baptistery, at that time, was at least equal to the neighbouring cathedral in importance. The Baptistery has eight equal sides with a rectangular addition on the west side. The sides, originally constructed in sandstone, are clad in geometrically patterned colored marble, white Carrara marble with green Prato marble inlay, reworked in Romanesque style between 1059 and 1128. The pilasters on each corner, originally in grey stone, were decorated with white and dark green marble in a zebra-like pattern by Arnolfo di Cambio in 1293. The style of this church would serve as a prototype, influencing many architects, such as Leone Battista Alberti, in their design of Renaissance churches in Tuscany. The apse was originally semicircular, but it was made rectangular in 1202. As recommended by Giotto, Andrea Pisano was awarded the commission to design the first set of doors in 1329. The south doors were originally installed on the east side, facing the Duomo, and were transferred to their present location in 1452. The bronze-casting and gilding was done by the Venetian Leonardo d'Avanzo, widely recognized as one of the best bronze smiths in Europe. This took six years, the doors being completed in 1336. These proto-Renaissance doors consist of 28 quatrefoil panels, with the twenty top panels depicting scenes from the life of St. John the Baptist. The eight lower panels depict the eight virtues of hope, faith, charity, humility, fortitude, temperance, justice and prudence. The moulded reliefs in the doorcase were added by Lorenzo Ghiberti in 1452. There is a Latin inscription on top of the door: "Andreas Ugolini Nini de Pisis me fecit A.D. MCCCXXX" (Andrea Pisano made me in 1330). These north doors would serve as a votive offering to celebrate the sparing of Florence from relatively recent scourges such as the Black Death in 1348. Many artists competed for this commission and a jury selected seven semi-finalists. These finalists include Lorenzo Ghiberti, Filippo Brunelleschi, Donatello and Jacopo della Quercia, with 21-year-old Ghiberti winning the commission. At the time of judging, only Ghiberti and Brunelleschi were finalists, and when the judges could not decide, they were assigned to work together on them. Brunelleschi's pride got in the way, and he went to Rome to study architecture leaving Ghiberti to work on the doors himself. Ghiberti's autobiography, however, claimed that he had won, "without a single dissenting voice." The original designs of The Sacrifice of Isaac by Ghiberti and Brunelleschi are on display in the museum of the Bargello. It took Ghiberti 21 years to complete these doors. These gilded bronze doors consist of twenty-eight panels, with twenty panels depicting the life of Christ from the New Testament. The eight lower panels show the four evangelists and the Church Fathers Saint Ambrose, Saint Jerome, Saint Gregory and Saint Augustine. The panels are surrounded by a framework of foliage in the door case and gilded busts of prophets and sibyls at the intersections of the panels. Originally installed on the east side, in place of Pisano's doors, they were later moved to the north side. They are described by the art historian Antonio Paolucci as "the most important event in the history of Florentine art in the first quarter of the 15th century". Ghiberti was now widely recognized as a celebrity and the top artist in this field. He was showered with commissions, even from the pope. In 1425 he got a second commission, this time for the east doors of the baptistery, on which he and his workshop (including Michelozzo and Benozzo Gozzoli) toiled for 27 years, excelling themselves. These had ten panels depicting scenes from the Old Testament, and were in turn installed on the east side. The panels are large rectangles and are no longer embedded in the traditional Gothic quatrefoil, as in the previous doors. Ghiberti employed the recently discovered principles of perspective to give depth to his compositions. Each panel depicts more than one episode. In "The Story of Joseph" is portrayed the narrative scheme of Joseph Cast by His Brethren into the Well, Joseph Sold to the Merchants, The merchants delivering Joseph to the pharaoh, Joseph Interpreting the Pharaoh's dream, The Pharaoh Paying him Honour, Jacob Sends His Sons to Egypt and Joseph Recognizes His Brothers and Returns Home. According to Vasari's Lives, this panel was the most difficult and also the most beautiful. The figures are distributed in very low relief in a perspective space (a technique invented by Donatello and called rilievo schiacciato, which literally means "flattened relief".) Ghiberti uses different sculptural techniques, from incised lines to almost free-standing figure sculpture, within the panels, further accentuating the sense of space. Michelangelo referred to these doors as fit to be the Gates of Paradise (It. Porte del Paradiso), and they are still invariably referred to by this name. Giorgio Vasari described them a century later as "undeniably perfect in every way and must rank as the finest masterpiece ever created". Ghiberti himself said they were "the most singular work that I have ever made". The Gates of Paradise situated in the Baptistery are a copy of the originals, substituted in 1990 to preserve the panels after over five hundred years of exposure and damage. To protect the original panels for the future, the panels are being restored and kept in a dry environment in the Museo dell'Opera del Duomo, the museum of the Duomo's art and sculpture. Some of the original panels are on view in the museum; the remaining original panels are being restored and cleaned using lasers in lieu of potentially damaging chemical baths. Three original panels made a US tour in 2007-2008, and then were reunited in a frame and hermetically sealed with the intention of making the panels appear in the context of the doors for public viewing. One of the few copies made in the 1940s is installed in Grace Cathedral, in San Francisco; copies of the doors are also crafted for the Kazan Cathedral in Saint Petersburg, Russia and in 2017 for the Nelson-Atkins Museum of Art in Kansas City, Missouri. The Gates of Paradise are surmounted by a (copy of a) group of statues portraying the Baptism of Christ by Andrea Sansovino. The originals are in the Museo dell'Opera del Duomo. He then left to Rome to work on a new commission, leaving these statues unfinished. Work on these statues was continued much later in 1569 by Vincenzo Danti, a sculptor from the school of Michelangelo. At his death in 1576 the group was almost finished. The group was finally completed with the addition of an angel by Innocenzo Spinazzi in 1792. 1. The angel announces to Zachariah. 4. Birth of the Baptist. 5. Zachariah writes the boy's name. 6. St John as boy in the desert. 7. He preaches to the Pharisees. 9. Baptism of his disciples. 11. St John reprimands Herod Antipas. 12. Incarceration of St. John. 13. The disciples visit St. John. 14. The disciples visit Jesus. 16. Decapitation of St. John. 17. Presentation of St John's head to Herod Antipas. 19. Transport of the body of St. John. 3. Adoration of the magi. 4. Dispute with the doctors. 7. Chasing the merchants from the Temple. 8. Jesus walking on water and saving Peter. 11. Entry of Jesus in Jerusalem. 13. Agony in the Garden. 10. Solomon and the Queen of Sheba. The interior, which is rather dark, is divided into a lower part with columns and pilasters and an upper part with a walkway. The Florentines didn't spare any trouble or expense in decorating the baptistery. The interior walls are clad in dark green and white marble with inlaid geometrical patterns. The niches are separated by monolithic columns of Sardinian granite. The marble revetment of the interior was begun in the second half of the eleventh century. The building contains the monumental tomb of Antipope John XXIII by Donatello and Michelozzo Michelozzi. A gilt statue, with the face turned to the spectator, reposes on a deathbed, supported by two lions, under a canopy of gilt drapery. He had bequeathed several relics and his great wealth to this baptistery. Such a monument with a baldachin was a first in the Renaissance. The Baptistery is crowned by a magnificent mosaic ceiling. It was created over the course of a century in several different phases. 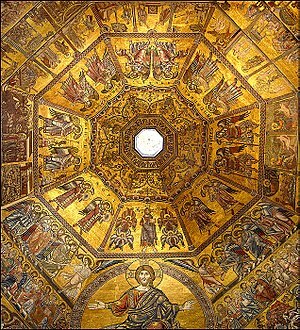 The oldest parts are the upper zone of the dome with the hierarchy of angels (2,3), the Last Judgment on the three western segments of the dome (1) and the mosaic above the rectangular chapel on the western side. An inscription in the mosaic above the western rectangular chapel states the date of the beginning of the work and the name of the artist. According to this inscription, work on the mosaic began in 1225 by the Franciscan friar Jacobus. The artist was previously falsely identified to be the Roman mosaicist Jacopo Torriti, who was active around 1300. In accordance with his style, Jacobus was trained in Venice and strongly influenced by the Byzantine art of the early to mid-thirteenth century. Since the inscription also names Emperor Frederick II, the inscription and the completion of the first phase of mosaics must fall within the Ghibelline phase of Florentine rule between 1238 and 1250. The Last Judgment, created by Jacobus and his workshop, was the largest and most important spiritual image created in the Baptistery. It shows a gigantic majestic Christ and angels with the instruments of the passion at each side (formerly attributed to the painter Coppo di Marcovaldo), the rewards of the saved leaving their tomb in joy (at Christ's right hand), and the punishments of the damned (at Christ's left hand). This last part is particularly famous: evil doers are burnt by fire, roasted on spits, crushed with stones, bitten by snakes, gnawed and chewed by hideous beasts. The other scenes on the lower zones of the five eastern sections of the dome depict different stories in horizontal tiers of mosaic : (starting at the top) stories from the Book of Genesis; stories of Joseph; stories of Mary and the Christ and finally in the lower tier : stories of Saint John the Baptist, patron saint of the church. A total of sixty pictures originated in the last decade of the thirteenth century. The key artists employed were Corso di Buono and Cimabue. It is the most important narrative cycle of Florentine art before Giotto. In the drum under the dome many heads of prophets are depicted. Some chapels of the gallery are also decorated with mosaic. These parts were executed around 1330 by mosaicists from Siena. Plan of the mosaic ceiling : 1. Last Judgement. 2. Lantern. 3. Choirs of Angels. 4. Stories from the Book of Genesis. 5. Stories of Joseph. 6. Stories of Mary and Christ. 7. Stories of St. John the Baptist. Composite image of all eight sides of the ceiling counter-clockwise from Christ. ^ Liukkonen, Petri. "Dante Alighieri". Books and Writers (kirjasto.sci.fi). Finland: Kuusankoski Public Library. Archived from the original on 17 August 2008. ^ "Eight-Point Star (Star of Redemption) - cited 2011-05-21". Religionfacts.com. ^ See Laurie Schneider Adams, Italian Renaissance Art, (Boulder, Colorado: Westview Press, 2001), 60. Actually, at the time of the 1401 competition the Florence baptistery needed two portals to be decorated. The aim of the 1401-02 competition was to begin work on this project. See also Monica Bowen, "Ghiberti's North Doors," from Alberti's Window, July 24, 2010. ^ Julian Bell (2007). Mirror of the World: A New History of Art (1st paperback ed.). Thames & Hudson. p. 161. ISBN 978-0-500-28754-5. It is noticeable nonetheless that the casting of one column has been mistakenly overlaid over a flagellator's arm, as it were trapping his hand. ^ Vogel, Carol (October 16, 2006). "One of Florence's Renaissance Prizes to Go on U.S. Tour". New York Times. The New York Times Company. ^ "Gates of Paradise to be Installed at Nelson-Atkins". Nelson-Atkins Museum of Art. 28 January 2017. Retrieved 11 October 2018. ^ a b Schwarz, Michael Viktor (1 January 1997). Die Mosaiken des Baptisterium in Florenz: Drei Studien zur Florentiner Kunstgeschichte. Cologne: Böhlau-Verlag GmbH. p. 171. ISBN 9783412106966. OCLC 931181326. ^ "Brunelleschi & Ghiberti, The Sacrifice of Isaac". Smarthistory at Khan Academy. Retrieved January 6, 2013. Wirtz, Rolf C. (2005). Kunst & Architectur, Florenz. Tandem verlag. Jepson, Tim. The National Geographic Traveler. Florence & Tuscany. National Geographic Society. Mayer, Yakov Z. Crying at the Florence Baptistery Entrance: A Testimony of a Traveling Jew. Renaissance Studies. Wikimedia Commons has media related to Battistero di San Giovanni.